A type of mixing utensil that is best used to blend light sauces and ingredients. 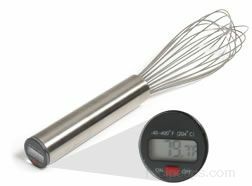 The head of this whisk has a broader more round shape than a French whisk, and commonly ranges in size from 8 to 14 inches in length. The whisk typically contains 7 to 8 wires, which are not as many wires as a French whisk. When selecting, make sure the whisk has a sealed surface where the wires enter the handle, to keep food from accumulating in hard to clean areas.